People interested in inspirational and symbolic jewelry should consider a tree of life necklace. The tree of life is a symbol that appears in the folklore of many different cultures and has ties to both religion and metaphysics. 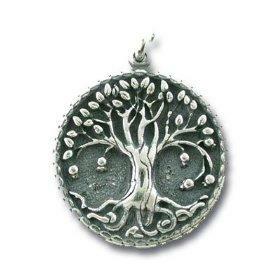 Today the tree of life is a popular theme for symbolic, spiritual and fashion jewelry. The tree of life is an ancient symbol that has crossed cultures and religions for thousands of years. The tree of life symbolizes knowledge, wisdom and the interconnection of all life. Artwork and jewelry depicts tree of life symbols among many early cultures, including ancient Egypt. The ancient Egyptians believed that the tree of life was connected to the god Osiris, was dually associated with death and fertility. They saw the trunk as the center of the universe with roots leading to the underworld and branches that reached toward the heavens. Modern Egyptian tree of life pendants typically feature either a tree with roots extending into the ground and branches reaching toward the sky. Some designs include an image of the tree of life with Osiris. Long ago, the Celts viewed the tree of life as holding a symbol of all life; the roots reached into the underworld, the trunk rested on earth and the branches reached toward heaven. Celtic druids believed the tree was a doorway between the spirit world and the human world, which allowed the gods to communicate with people. Celtic tree of life pendants are the most popular type. The pendants and necklace designs include detailed engravings of abundantly leaved trees reaching skyward with a broad trunk and firm roots buried deep in the earth. Celtic Christian designs may include a cross on the trunk. Neopagan style pendants may include an engraving of the green man or the image of a woman in the trunk to represent the goddess. Chinese folklore tells of a mystical tree of life that bore fruit only once every three thousand years. Anyone who ate the fruit would become immortal. Necklace designs that follow Chinese folklore often depict an abundant fruit tree. Some pendants also include other symbols such as yin and yang. In the Judeo-Christian tradition, the Bible describes a tree of life in the Garden of Eden. After Adam and Eve eat the forbidden fruit of the tree of knowledge of good and evil, God casts them out of the Garden of Eden before they can eat from the tree of life, which would allow them to live forever. Christian tree of life jewelry ranges from simple engravings of a tree with roots to heavily foliaged trees with fruit reaching toward heaven with the roots ground into the earth. The tree of life is also a prominent part of the Jewish Kabbalah teachings. The tree of life is described in the Sefer Yetzira (Book of Creation), which explains creation in a precise set of numbers and letters of the Hebrew alphabet to form the "32 paths of secret wisdom". Tree of life pendants inspired by the Kabbalah are often based upon sacred geometry concepts. They symbolize unity and joy. The baobab tree, which has grown in many African countries for centuries, is often referred to as the "tree of life". A Senegalese legend claims that the god Thora threw the baobab tree out of his paradise garden, where it landed on earth upside down and thrived. The baobab tree is called the "tree of life" because of its ability to store up to 4,500 litres of water in its trunk and bear a fruit that provides large quantities of vitamin C, calcium and antioxidants. The fruit is often used as a cure all holistic remedy. When water is scarce, both people and animals have turned to the baobab as a life saving water source. A hollowed-out trunk of a large baobab tree can shelter as many as 40 people. Baobab tree jewelry is available that honors the tree's status as the "tree of life". Pendant designs include simple engraved images of baobab trees and elaborate designs of baobab trees with gemstones. Today the tree of life is still an important symbol because of its history and meanings. The mass appeal of the tree of life has made it a trendy theme for jewelry. Necklaces and pendants are the most popular form of tree of life jewelry. The designs range from engravings of trees on metal and painted tree sketches on resin to sculpted metal tree and gemstone arrangements. Many pieces are available in materials such as sterling silver, pewter and resin as well as white and yellow gold. Ross Simons: Ross Simons sells tree of life jewelry such as a gold engraved necklace and two-toned silver and gold necklace. Wellstone Jewelry: Wellstone offers a detailed sterling silver and gemstone pendant. Ka Gold Jewelry: Based in Israel, Ka Gold Jewelry features the work of cosmic jewelry artist David Weitzman, who designs spiritual and symbolic jewelry. He sells a tree of life pendant that uses sacred geometry concepts. The Tree of Life theme necklace will remain popular for years to come because of its diverse audience. The tree of life appeals to people from all different walks of life because of the symbol's rich history and the wide selection of beautifully crafted designs.